David Moyes sprang a surprise by starting with Victor Anichebe in attack with Leon Osman returning from injury to replace Steven Pienaar on the leftside of the Blues midfield in a familiar 4-5-1 setup. Man City shuffled their pack also with Kolorov coming back from suspension on the left side of defence and the hapless Milner coming in for De Jong in the City engine room in a similar 4-5-1 formation with Tevez playing the ‘Ghost Nine’ role with the narrow support provided by Silva, Yaya Toure & Balotelli. Everton where out the traps and right on the offensive, taking the lead after just four minutes when a trademark steam up the left by Baines resulted in the ball switching to the right flank . Coleman beat him man and popped a pinpoint cross to Cahill who did what he does best against City and score. It must be said that he was assisted by some truly comedy marking by Kolo Toure and Vincent Kompany. 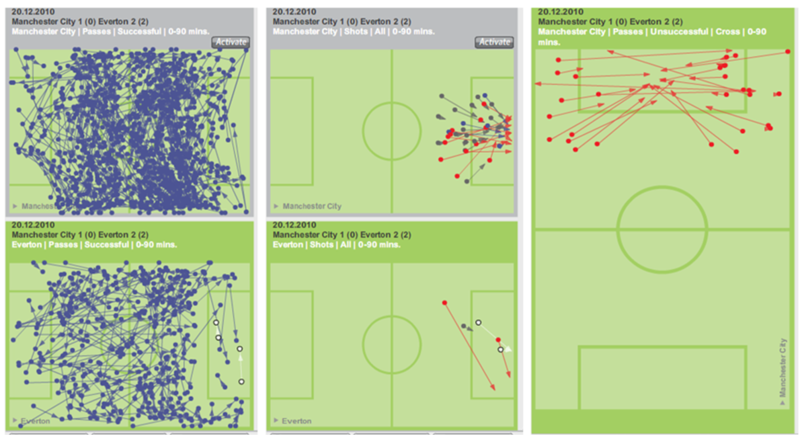 Everton’s attacking intent was surprising City and the Blues continued to enjoy decent possession in the City half. City’s rightback Zabaleta was off the field receiving treatment for a gashed eye for almost 8 minutes, and this was to prove fatal. As mentioned in the preview, David Silva cuts inside a lot and doesn’t retain his position on the right, and with Milner filling in for Zabaleta Everton played a lovely move with Baines and Anichebe getting a 2 on 1 situation down the left, combining to pass into Cahill who teed up Baines for a right foot curler into Hart’s left hand post. Textbook. Content with the 2 goals, Everton then sat back as City began to dominate possession. 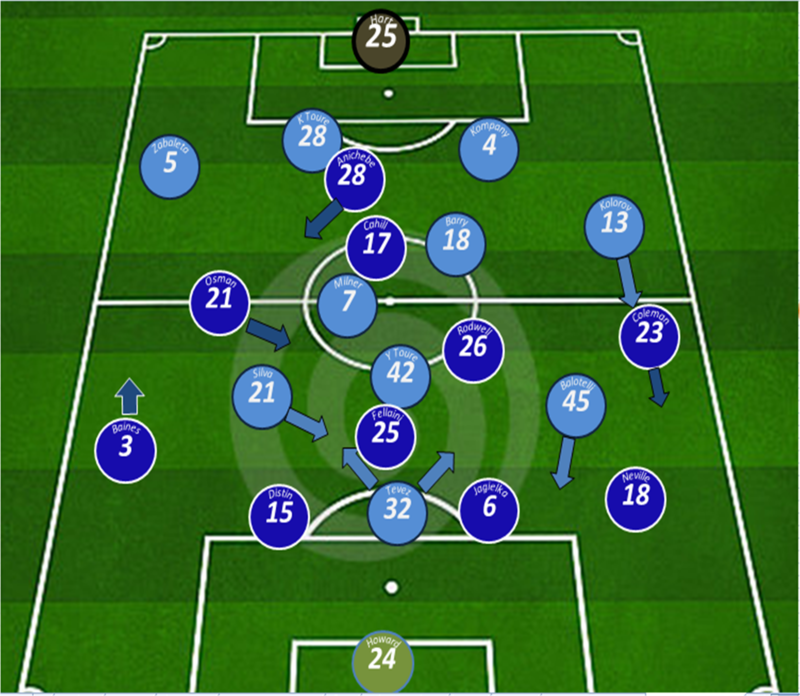 Everton where solid through the middle and forcing City out to the flanks where they are weaker, shown by screenshots A, B & C. When City did work a shooting chance they where met by a sea of blue, summed up nicely in screenshot D where Silva is met by 10 Everton players between the ball and goal. This mass of bodies through the middle led City out to the flanks, leading to a staggering 28 crosses being unsuccessfully delivered. This really played into our hands given our aerial edge. City where dominating play, making in total 584 successful passes to our 233 but often their play resulted in poor crossing or shooting from distance. Indeed, of the 34 chances they carved out only 5 required Howard to make saves. The City dominance was aided and abetted by our own tactics with David Moyes seemingly encouraging us to sit back further and soak up pressure, with Anichebe playing more as a left sided player and Osman cutting inside often leaving us with 6 players screening the back four. This was successfully quelling City attacks but it left Cahill isolated as the furthest forward of our players. The second period began as the first ended with City in control of the ball, with substitute Adam Johnson causing problems down our left side and Tevez seeing more of the ball in the final third. We where still playing very deep with Fellaini in particular having a stormer, achieving 100% completion in his passing stats. This tenacity in the tackle was a theme of the evening with the Blues making 16 blocks and 21 interceptions in the game. The game erupted into controvesery midway through the second half when Anichebe was dismissed for 2 quick fire harsh bookings. There was no malice in the Nigerian’s challenges and where more to do with his obvious tiredness just as Moyes was set to replace him for Saha. City then turned up the heat and after Jagielka unluckily turned Yaya Toure’s cross into his own net, Balotelli then hit the post as City where looking as though they where turning the screw on the Blues. Saha then make an appearance, along with Billy, for Osman and Coleman in the last 15 minutes . These changes helped to quell the City threat in giving us an outlet further forward as beforehand we had continued to invite City pressure with our resistance tested intensely. We rode our luck tonight at times but for the shear hard work and determination we showed this was 3 points well deserved. Moyes deserves much credit for tactically getting this spot on. We have dominated plenty of games in terms of possession and chances created this season just like City did to us tonight, so it was glad to be the team who took its chances this time. This win should give us the confidence to kick on and take a decent point’s hall from the Christmas programme. This entry was tagged Shape, Tactics. Bookmark the permalink.